You can only control 1 “Tsukahagi, the Poisonous Mayakashi”. 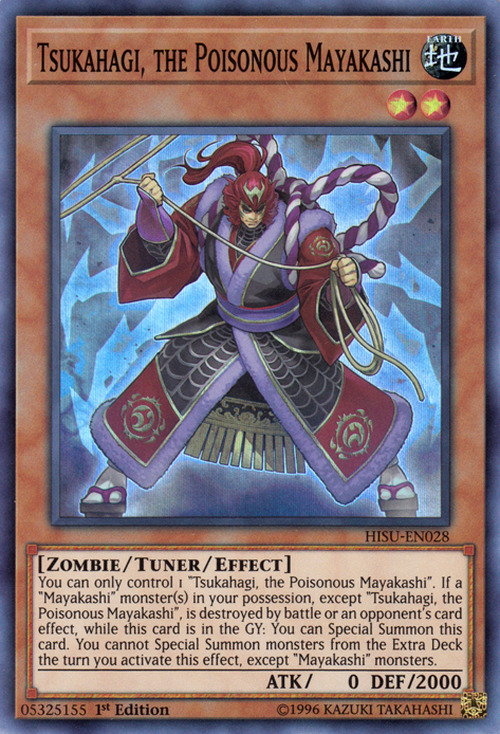 If a “Mayakashi” monster(s) in your possession, except “Tsukahagi, the Poisonous Mayakashi”, is destroyed by battle or an opponent's card effect, while this card is in the GY: You can Special Summon this card. You cannot Special Summon monsters from the Extra Deck the turn you activate this effect, except “Mayakashi” monsters. Tsuchigumo, the Poisonous Mayakashi is the Synchro counterpart of this card. Its name derives from 八束脛 yatsukahagi, another name of the spider monster tsuchigumo.